Every day is for the thief, one day is for the owner. Which simply interprets as; one can lie, cheat, steal and do whatever evil one could, one is sure going to meet downfall someday. This was the case of a robber who must have been robbing innocent and helpless people for a hobby but got caught up by karma when he tried to rob a Mixed Martial Art lady (MMA). Meet Polyana Viana Mota aka Poly or The Iron Lady, an MMA fighter, standing at a formidable female height of 5'7'' and a reach of 67.0', the 27 years old Brazilian has a good MMA record of 10 wins and just 2 loses. She also adds fashion to her MMA finesse by endorsing and modeling products ranging from clothes to equipment on Instagram, with her Instagram account boasts of about 400000 followers. It was on a quiet evening , Saturday the 5th, 2019, Polyana was outside her apartment in Rio De Janeiro, Brazil waiting for her Uber to arrive when the evil perpetrator approached her and asked for the time with an ulterior motive of stealing from her, a smart Poly had sensed something was not right about him quickly hid her phone and was alerted like the boy scouts motto says 'Be Prepared', soon after the would-be-robber demanded Poly hand over her phone, threatened her with a 'gun' which turned out to be a paper made gun. Ha Ha Ha! 'taking a paper to a martial art fight huh'. He was really close to me, so I thought, if it's a gun, he won't have time to draw it, so I stood up and I threw 2 punches and a kick - Polyana explained. Poly further said she caught the robber in a martial art's rear-naked choke move and succeeded in incapacitating the hoodlum till the police arrived to apprehend him. 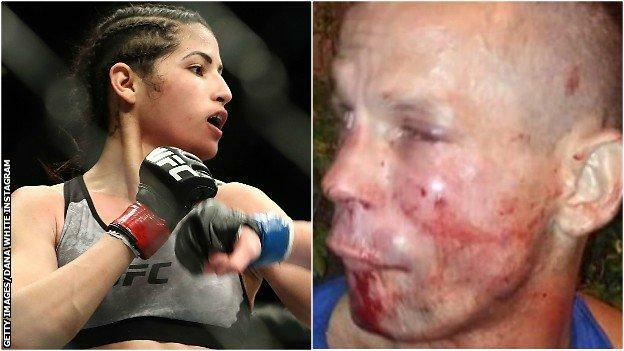 This was not the first time Polyana has been attacked by thugs, another incident was reported sometimes whilst she was away at her home town of Belem, Brazil, when 2 robbers on motorcycle tried to take her phone off her, but she punched one of them in the face to scare them off and away on their motorcycle. Justice set and served in both cases, isn't it? Bruce Lee will look down wherever he is and chuckled in agreement with Polyana, that's my 'gurl' he would say. Polyana is a trained and skilled MMA fighter and to some extent could be justified for resisting and fighting back robberies, but to some of us that can not even throw a punch let alone a martial art-like moves, I will advise not to resist a robbery, there could be a real gun/knife or other dangerous weapons and it could get really messy. It is better to live and fight another day so to say. Robber Union in Rio de Janeiro is asking that the UFC should please give a fight to Polyana soon! They are worried about their safety while she is [loose] out there and with nothing to do! For me, my little brother knows a thing or 2 about martial art, it is time I eat a humble pie and meet him for some tutorials.